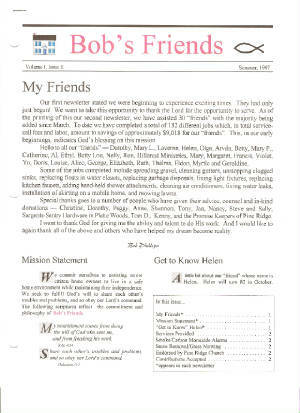 Below is our original newsletter from the "Summer 1997", our claim that Bob's Friends has been in my heart for 18+ years. We recieve calls from either the home owner or concerned neighbor, friend or agency. We contact the home owner regarding the safety concern/concerns in their home. We inspect the problem/problems and evaluate the best possible solution. We then use our repair associates to make the repairs. We have certified and licensed associates for any job that requires the certified technicians. We have certified/licensed plumbers, electricians, and HVAC on staff. We attempt to provide this service for homeowners over the age of 55 who are on limited incomes, ie., social security, disability, and reduced retirements. We will evaluate all homeowners over 55 on a case by case basis. We are not intrusive regarding your finances. This is a service from the Lord and we will be directed to those truly in need. We are committed to following God's word and finishing His works. Simply click on the DONATE button and it will take you just a few clicks to help one of our Senior Friends.